Popular science at its best! 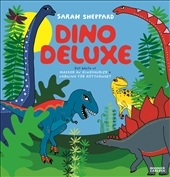 Sarah Shepherd has been entertaining children with amazing facts for ten years now and she is the uncrowned queen of Dino. Her imaginative books are a wonderful mixture of colour, humour and fascinating facts, making it impossible not to be intrigued by the subject, and this one is a compilation of Shepherd’s most interesting, most fascinating and most amusing facts from Once Upon a Time…, Masses of Dinosaurs and Beware of the Meatgang, all presented together with new and amazing information that researchers have uncovered over the past ten years. This is a reference book that all Dino lovers should have in their bookcases!